It is reputed that Socrates used to put wet mud on his clients and looked to see where it dried first, to look for inflammation in the body. Early in the history of Chiropractic, doctors would use the back of their hands to locate “hot boxes”, or for locations of decreased heat along the spine. In the 1930's, a chiropractic patient named Dossa Evans, who was an electrical engineer, asked his chiropractor if he'd be interested in a device to measure the temperature changes along the spine. His first instrument was named the Neurocalometer or the NCM. This device was used to compare the temperature on both sides of the spine. If one side were colder than the other was, the needle would jump towards that side. Later, a graphing mechanism was attached to record those readings. This lead to the documentation of those heat assymetries, and a system called “pattern analysis”. The doctor can take a series of “graphs” on the first visit. I take one before I examine a new patient, a second one after the exam, and occasionally a third one, just before the patient receives their first adjustment. We expect a “normal graph” to look different each time, since it is only a momentary “snapshot” of skin temperature. When a cold spot(s) remains at the same spinal level through a series of graphs, we define that as an abnormal “pattern”...suggesting that the body's thermostat is stuck...and this is one indication of spinal subluxation. Today there are more sophisticated, computer assisted instruments which take those readings, by measuring the infrared heat that radiates from our skin. Clinically, we know that your head should be about one degree warmer than your low back region. So a normal graph should slowly warm as you move from the tailbone to the back of the head. The brain controls all body functions, either through “hard wiring” (our nerves) or indirectly through release of hormones and neuro-transmitters. When there is interference in the nervous system from what we call a subluxation, the brain changes the way the body operates. I use an infrared measuring device, called the "Derma-Thermograph (aka the DT-25) to help me with chiropractic analysis. A graph is taken at the beginning of each visit. This is a Dermathermograph (DTG). This is an initial graph of a 47 year old female who presented with a complaint of neck pain and stiffness, with radiation into the trapezius region bilaterally. She also experienced long-standing migraines. 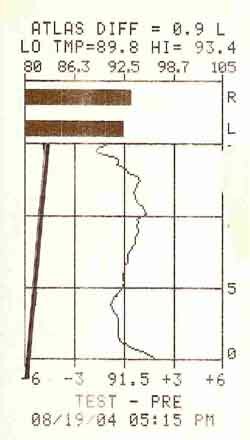 Each vertical line to the right or the left of the mid-line represents an increase or decrease of 3° in temperature. The horizontal lines reprersent 5 seconds, so this scan took 15 seconds. Graphs are taken from the tailbone to the occiput (base of skull). Ideally, the head should be 1° warmer than the low back. Thus, a “normal” graph will warm (or, move to the right) as it progresses to the top of the paper. I have sketched what would be a “normal” graph on the left of this graph. Note that it moves to the right, 1° warmer, or one-third of a bar to the right. 1. Note the high Atlas fossa reading, which is tallied at the top of the graph. In this graph, she is colder by 0.9° of a degree on the left side. The ideal differential should be 0.3° or less. This suggests that her Atlas could be subluxated, and may be contributing to her frequent headaches. 2. Note how the neck is significantly colder than the thoracics. This is because her cervical region had multiple subluxations. Since the second week of care, this patient no longer experiences headaches, and the range of motion of her neck increased dramatically. Her later graphs also normalized.